But that is no excuse, and I refuse to accept it as such. Time management is essential to any writer. It is time to take control. Authors describe writing as a full time job. It must be treated as such. Your job does not accept you couldn’t meet your deadline today because you had to do dishes or laundry or take your three year old for a walk to the park. Your job is also not okay with your shirking because you have to work your other job. Every job has to be treated separately, and the energy must be found, no matter what. 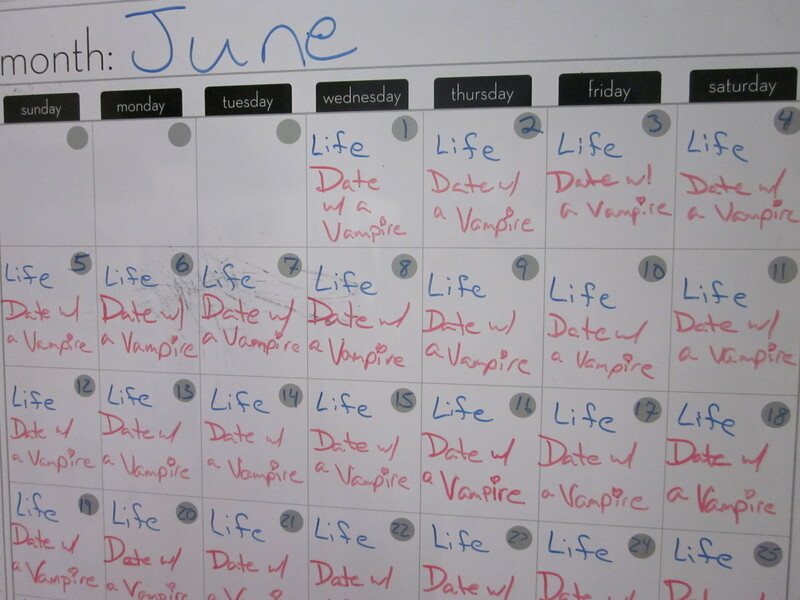 As such, it is time for me to set regular dates with a vampire. And a vampire hunter. And the woman between them. I mean who wouldn’t want to spend time with an exceedingly hot and talented vampire with deep chocolate eyes and mischief on his mind. Not to mention a depth of heart to rival most mortals. Certainly not a fate worse than death. Therefore, instead of the job before me, I plan on setting consistent and regular dates with my characters and their story. Specific date times to take them out and wine and dine them. Showing them a good time and hopefully they will return the favor. This entry was posted on Wednesday, May 25th, 2011 at 8:37 am	and tagged with Black Sun, Characters, Revising and posted in Black Sun, Writing Process. You can follow any responses to this entry through the RSS 2.0 feed. Wow, that means that we will have an Vampire visiting Germany. That will be something new and exiting!